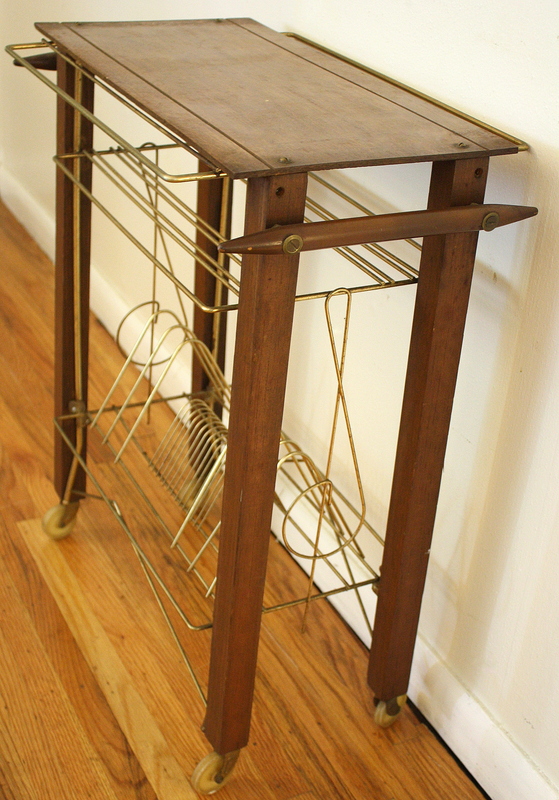 These are 2 mid century modern wire record rack stands. Both have a atomic gold ball details. 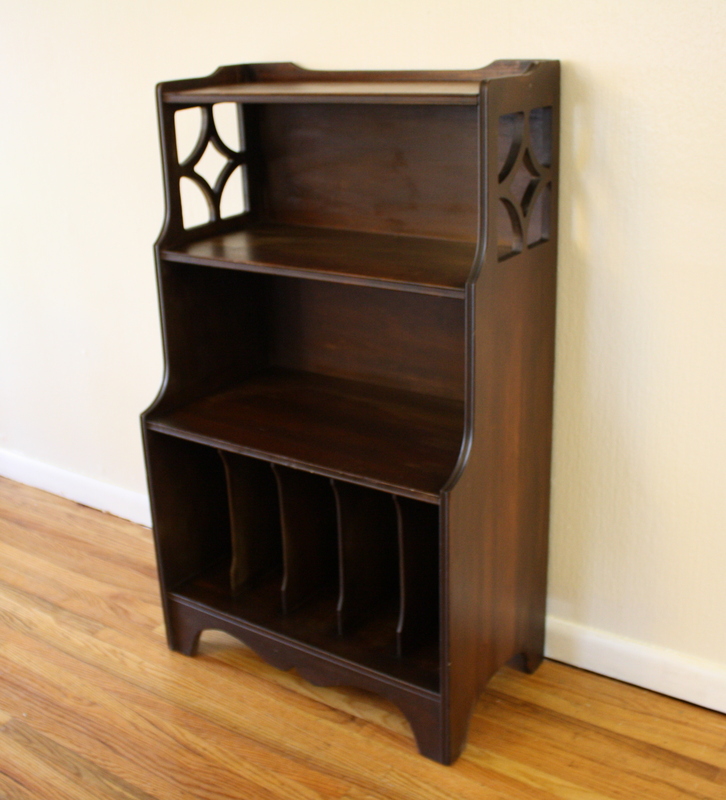 The first record rack has a great arched design and 2 levels of storage: 13.5″W x 12″D x 27″H. The second is a rolling record rack with a shelf on top to store more records or a record player: 20.5″W x 14″D x 27.5″H. Both record racks are sold. 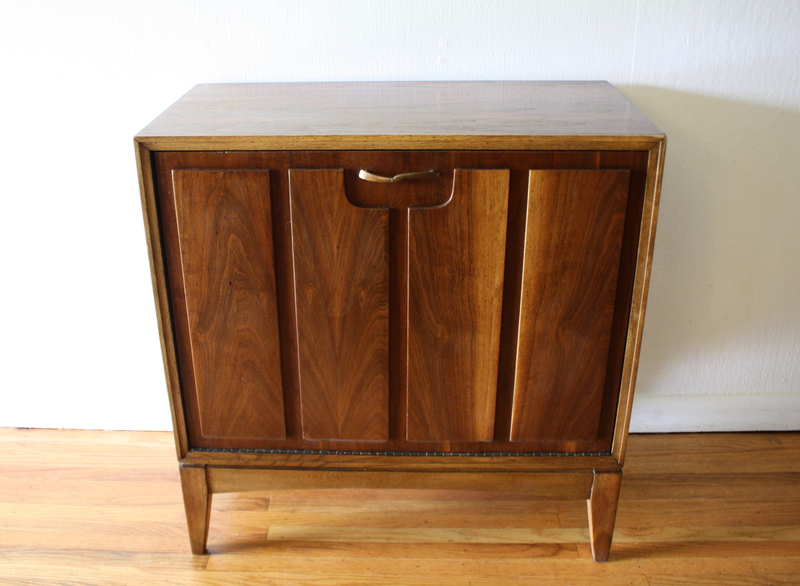 This is a mid century modern record cabinet by Lane. It has a beautiful wood grain and tapered legs. The cabinet slides open from the front to show groups of record slats for storage. Dimensions: 28″W x 15″D x 29″H. This is a mid century modern record cabinet with splayed metal legs. It has slatted dividers for records inside. Dimensions: 23″W x 17″D x 23.5″H. These are 2 mid century modern pieces with sculpted arches. The first is a demilune side end table from Kent Coffey’s Perspecta collection. It has the signature Perspecta sculpted arches, a door that swings open to reveal an open cabinet and drawer. 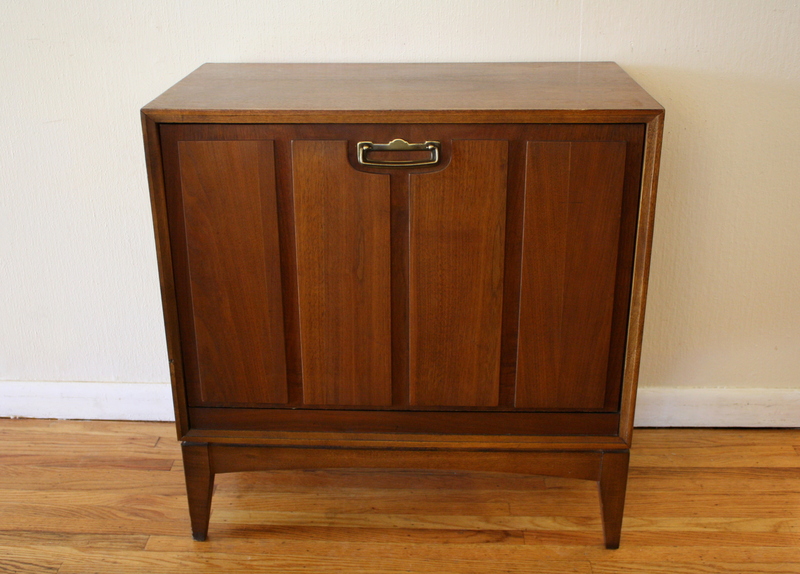 The second is a Broyhill Brasilia cabinet. 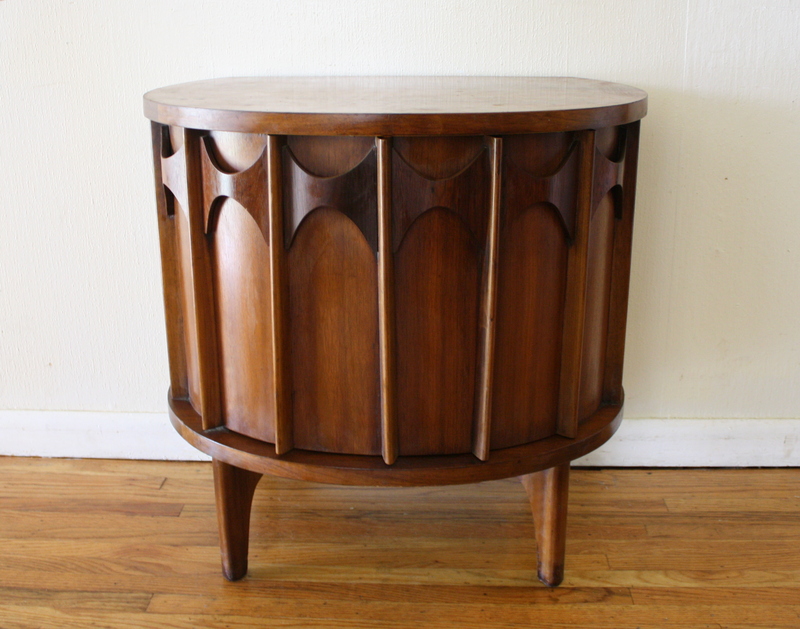 It has 2 doors that have the signature Brasilia sculpted arches, perfect fora record cabinet or additional storage. 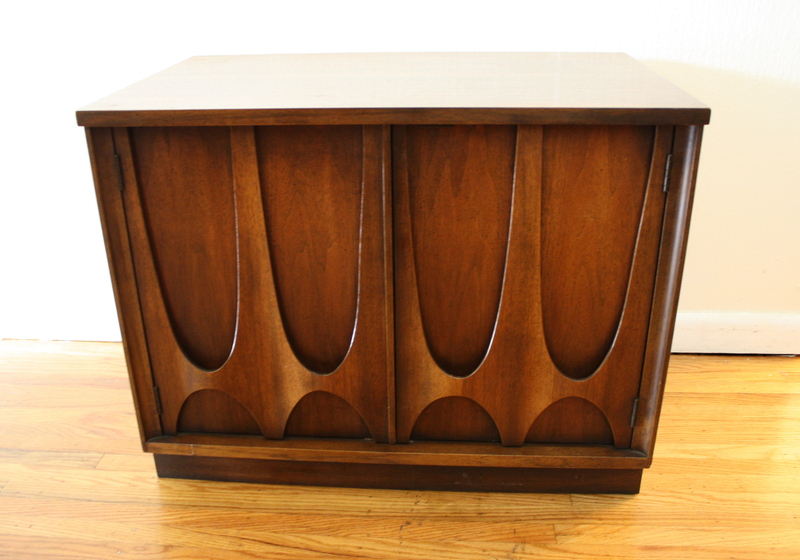 This is a mid century modern record cabinet by Lane. It is solid wood, has a front door that flips open for easy use, and tapered legs. Dimensions:28″W x 15″D x 28.5″H. Here is a selection of our mid century modern record racks and cabinets. Please read the captions for availability and prices. All record racks and cabinets are sold. These are 2 styles of record cabinets by Lane. The first record cabinet has top doors flip open for record storage and it rolls. Dimensions: 26″W x 15″D x 18″H. The second record cabinet has a front door that pulls open for record storage. We have 2 of these available. 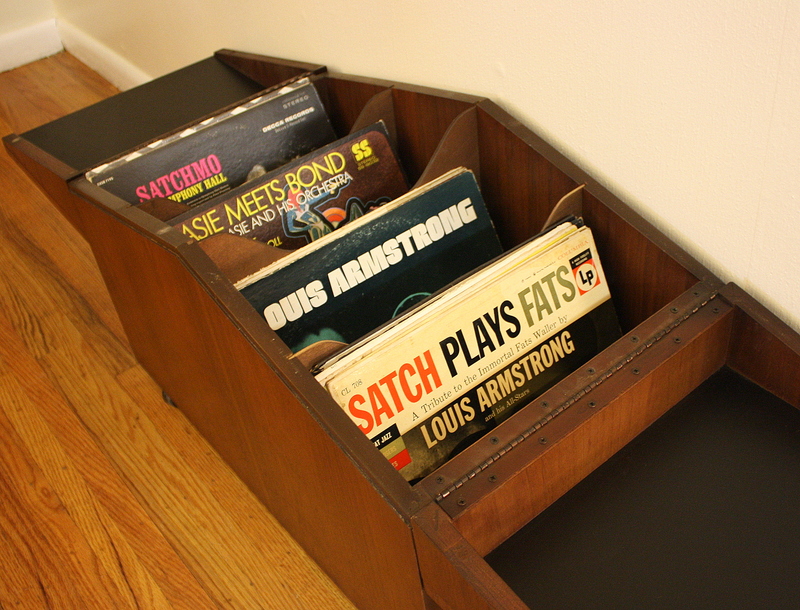 Great to use as end tables that also store your vinyl, and put your turntable on top. Dimensions: 29″W x 16″D x 27″H. 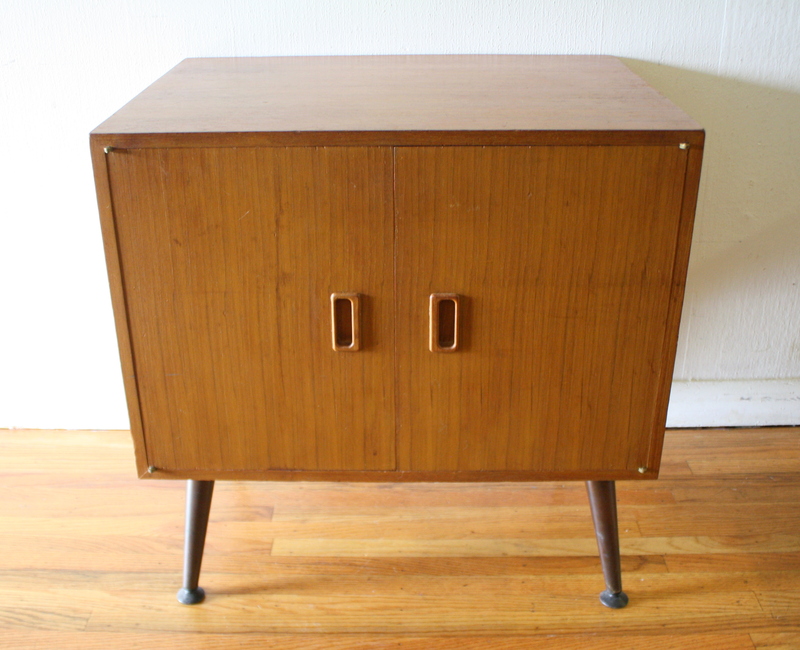 This is a mid century modern record cabinet with splayed legs. This is a vintage record shelf with a great gothic style. It is made of solid wood, has two shelves that can hold a turntable and speakers, and a bottom shelf that holds records. This is a mid century modern record rack with a sunburst design. It is made of metal, has a great retro vintage design, and can also function as a side end table. 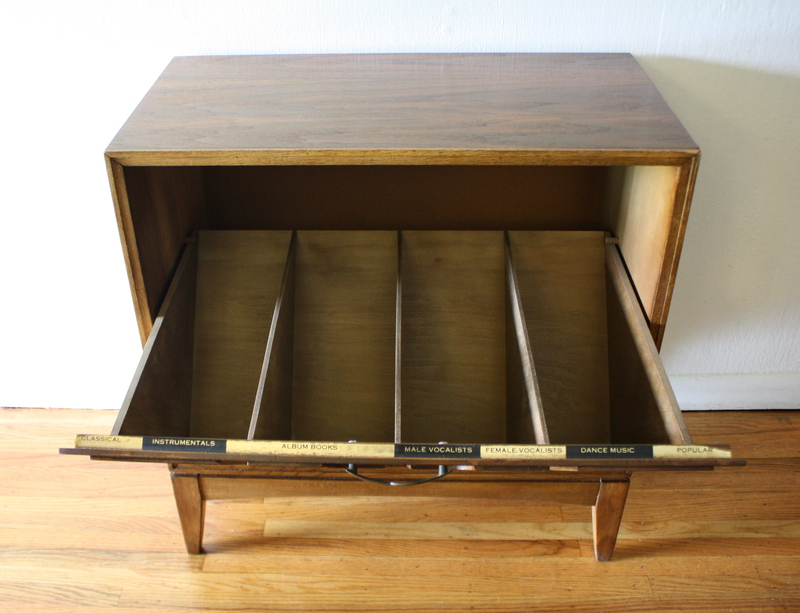 Store your favorite records, magazines or books, and accentuate your mcm look. This is a mid century modern rolling record rack. There is a great music design detail with the treble clef built in to the rack. The danish style handles are a great touch.